Nguyễn Thị Kim Nga, left, and her American father, Gary Wittig, are out for dinner in Riverdale, Georgia, during their first meeting since he left Vietnam in 1969. 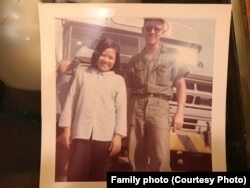 The first time Huỳnh Thị Chút set foot in the United States, she came to see Gary Wittig, the man she'd had a love affair with in Danang at the height of the Vietnam War. The Vietnamese woman had a daughter with the American seaman. That daughter, Nguyễn Thị Kim Nga, flew from her Nebraska home to meet her father’s family in a suburb of Atlanta, in the southeastern U.S. state of Georgia. Nga, who has lived in the U.S. for 17 years, then went to Atlanta’s Hartsfield-Jackson International Airport to pick up her mother. After a drive to the suburbs, Chút reunited with Wittig, now frail and on oxygen, 48 years after they parted. Huỳnh Thị Chút (right) takes care of Gary Wittig who was bedridden after a fall triggered a heart attack. They reunited in Atlanta, Georgia, 48 years after they first met in Đà Nẵng during the height of Vietnam War. The reunion was “completely amazing,” said Christine Kimmey, Wittig’s niece, who had gone to the airport with Nga, her newfound cousin, to pick up Nga's mother. “She (Chut) placed her hands on him and started massaging his lung, massaging his arms. They just sat there and smiled,” said Kimmey, adding that she couldn’t describe the excitement and joy of the Oct. 3 event. “It’s the best thing that could ever happen to my uncle,” she said. Wittig and Chút still could not speak each other’s languages. The other unchanged element of their relationship, Wittig thought, was Chút’s smile, which remained the same. Gary Wittig, right, and Huỳnh Thị Chút in Đà Nẵng, the central province of Vietnam. Wittig met Chút during his second tour to Vietnam from 1968-1969, where he worked as a duty driver at Camp Tien Sha. Wittig was 23 and on his second tour in Vietnam in 1968 when he met Chút, then 19, at Camp Tien Sha, part of Danang Air Base. Wittig, a seaman aboard the USS Pocono LCC 16 who began his U.S. Navy service in 1962, drove supply runs between the camp and the base where Chút and several young Vietnamese women worked as cleaners. Although Wittig didn’t speak Vietnamese and Chút could say only a few English words, they felt an attraction when they washed his truck together. But Chút was married with a son and a husband, a paratrooper in the U.S.-allied Army of the Republic of Vietnam. At the time, Chút said, she thought their affair was just “fun” until she discovered she was pregnant and told Wittig, who was scheduled to leave Vietnam. “I knew she was pregnant with my child and I knew it was a girl,” Wittig, 72, said while lying in his bed in a small house in Riverdale, an Atlanta suburb. A heavy smoker, Wittig had had chronic obstructive pulmonary disease (COPD) since his return from Vietnam and had been on oxygen support for three years. He'd been bedridden since September, when a fall triggered a heart attack. No one knows how many Amerasian children were born and ultimately left behind in Vietnam during the decade-long war that ended in 1975. 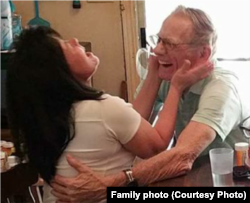 Nguyễn Thị Kim Nga, left, embraces her American father, Gary Wittig, when they met for the first time. Chút’s late husband knew about the affair but accepted the baby fathered by an American. “He took her as his own child,” said Chút, who burned all the pictures and anything related to Wittig when the American troops withdrew from Vietnam because she feared getting in trouble under the communist regime. Nga grew up with three half brothers in Me Pu, a rural village in the central province of Bình Thuận. “I felt lucky,” Nga said. Her stepfather treated her fairly, she said, unlike many children fathered by American soldiers. After her stepfather died of cancer, Nga’s family struggled and she dropped out of school to work. But she continued to nurture a dream of finding her American father. “I kept asking myself why I didn’t have a dad,” Nga said. Nga attempted to migrate to the U.S. on three separate occasions. She tried being adopted by a Vietnamese family that was willing to pay her in order to use her biracial status to obtain a special visa issued under the American Homecoming Act or Amerasian Homecoming Act, which took effect in 1989. The measure gave preferential immigration status to children in Vietnam born of U.S. fathers. She failed to obtain one of the special visas on her own. She tried to engage in a fake marriage with a Vietnamese man willing to pay all the costs of paperwork needed to get a visa. “I wanted to commit suicide,” Nga said. Finally, an anthropologist at the U.S. consulate in Hồ Chí Minh City identified Nga as Amerasian. In 2000, Nga, Quế and their then-5-year-old son left Vietnam for Omaha, Nebraska. Nga is one of more than 23,000 Amerasians who have entered the U.S. under the act. “We came to the U.S. with just a suitcase full of clothes. That was all we had,” said Nga, who decided that she could not spend the time or money to find her father. 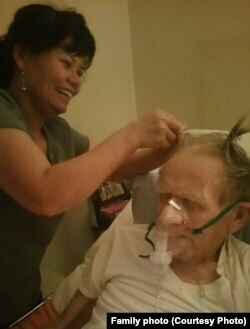 Nguyễn Thị Kim Nga, left, plays with Gary Wittig's hair while taking care of him in Riverdale, Georgia. Nga and Quế worked in a Mexican food service company, Casa De Oro Foods LLC. “My husband had to work two jobs at the same time to raise our family,” Nga said. Her family grew in 2002 with the birth of a daughter and again in 2005 with the addition of another son. The couple lost their jobs after the Mexican food service company where they worked was bought by another company. Nga found new work as a manicurist, and Quế became an Omaha Public Schools janitor. Early this year, a friend Nga had made in Omaha found her American father through DNA testing. The discovery set Nga on a quest to find her own father. It seemed like a long shot since only about 3 percent of the Ameriasians in the U.S. have found their fathers. Nga knew only that her father’s name was Gary and that she had been born shortly after he left Vietnam. Earlier this year, in January, she sent a saliva sample to a genetic testing service. Three months later, Cheryl Hester, the DNA detective who had helped Nga's friend find her American dad, also found a match for Nga. “(Nga) had a close match that was a first cousin on her father’s side and she had a second cousin on her father’s mother’s side. So she had two matches that were coming in what we call triangulation,’” said Hester, who is also a Vietnam veteran’s daughter. Hester contacted Wittig’s niece Kimmey on Facebook on March 31. “I knew right away what it was about,” Kimmey said. Wittig’s late wife, Linda, “for some reason let me and my sister know that Gary had a child in Vietnam,” said Kimmey, even though nobody else in the family discussed the child. Nguyễn Thị Kim Nga, left, helps her father, Gary Wittig, decide on Vietnamese dinner during their first meeting in Atlanta. In 1974, five years after coming home from Vietnam, Wittig had married his wife after meeting her at a photo lab in Largo, Florida. Linda died of breast cancer in 2006. “I wish I could take those 30 years back, but I can’t,” said Wittig, smiling at the memory of his late wife. The two didn’t have children. “What was special about this case was the father didn’t have any children and of course the wife has already passed,” said Hester, who says she's worked on “at least a hundred cases" from the Vietnam War era. The DNA detective said she didn’t know if that would have affect Wittig’s response to finding his long-lost daughter. She's had many cases in which American fathers didn’t accept their Amerasian children. Nga was nervous before her first meeting with Wittig on April 14. Would he accept her? Would his family? Wittig, however, said he is a religious person and had been praying to God to send him an angel. “Not everyone in my family has met Angel, but they know about the impact she has on Uncle Gary,” Kimmey said. Father and daughter did not have long together. Wittig died Nov. 24, hours after his extended, blended family gathered for Thanksgiving. Every day before his death, Nga called Wittig to check on him. Since that first encounter, she’d visited him on Father’s Day, in October for the reunion of her mother with Wittig, and then for Thanksgiving. EDITOR'S NOTE: An earlier version of this story erroneously stated that the Wittigs were married in 1969.